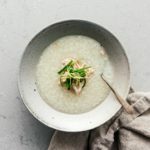 Creamy, comforting chicken congee is just minutes away in the instant pot. When I want a bowl of soupy comfort, nothing but congee will do. The only thing is, making congee on the stove takes a while. Like, hours. But, not anymore, thanks to the Instant Pot! 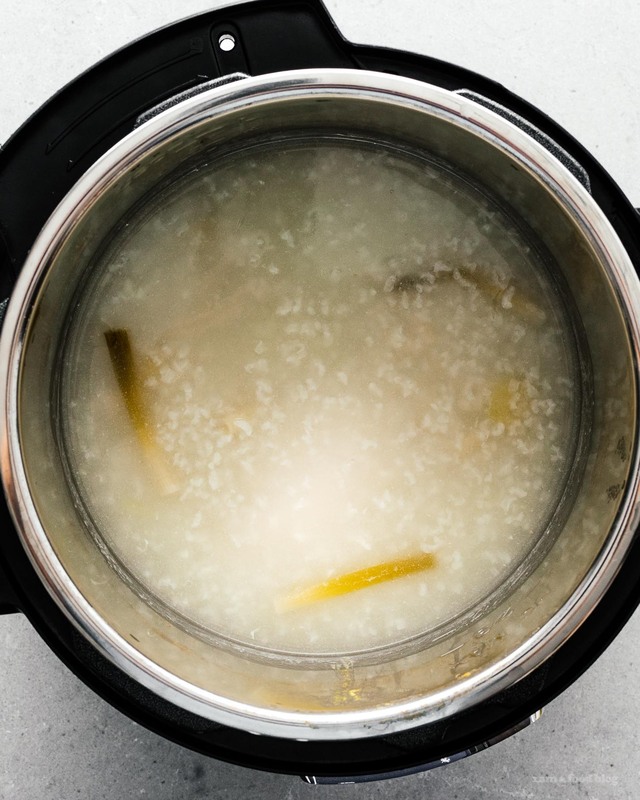 To be honest, I was kind of wary of making congee in the Instant Pot. I’ve been making congee on the stove for years and I have it dialed in, just the way I like it. But now that I’ve tried congee in the Instant Pot, I don’t think I’m going back. For those of you who haven’t had congee before, it’s Chinese rice porridge. Traditionally, it’s made on the stove, low and slow until the rice breaks down into a soupy texture. The result is creamy, smooth and utterly addictive. 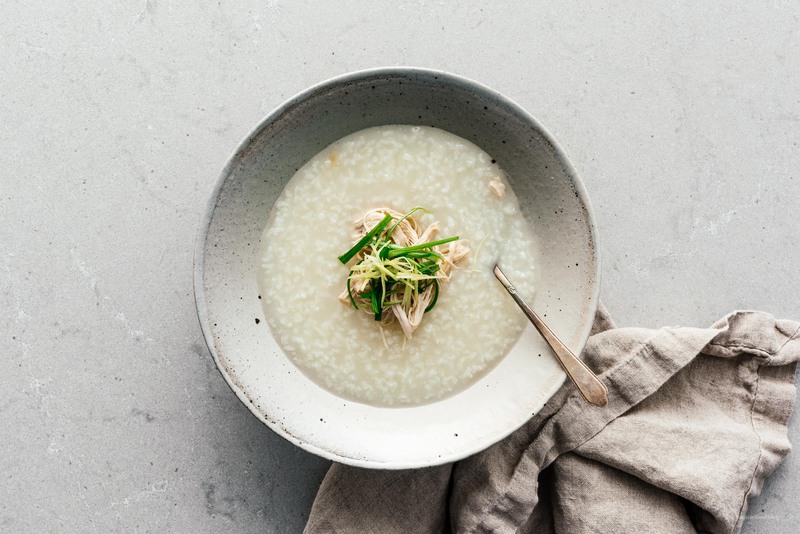 Congee has a super silky texture when you make it right – the starch from the rice goes right into the liquid, making it surprising luxurious for just two ingredients. 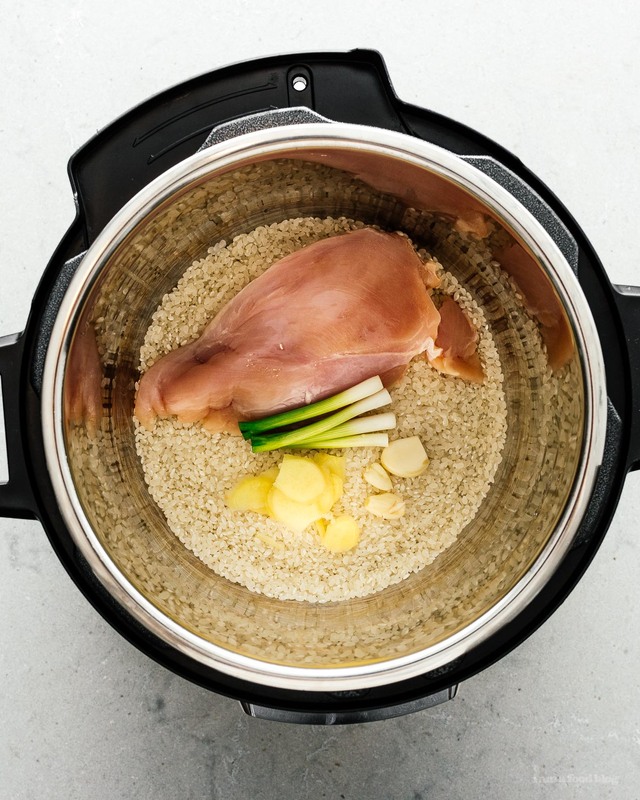 Using the Instant Pot instead of a pot on the stove is absurdly simple: put your rice, chicken stock, chicken, and aromatics in your Instant Pot insert. Press the button for “porridge,” set it and forget it. Minutes later, give everything a stir and shred your chicken and that’s it. I found that the congee made this way was infinitely more silky and creamy than on the stove. I think it might have something to do with the pressure, but I’m not sure. The only thing that isn’t quite the same is that you can’t really gauge how much liquid you’ll need. I went with 8 cups and got a relatively thick congee, which I love, but I still ended up thinning it out a bit. Depending on preference, you’ll definitely want to adjust. I kept it simple and just topped it off with green onions, but that’s only because we didn’t go to the store for savory Chinese doughnuts for dipping…maybe we’ll go tomorrow to get some! Place the rice, chicken stock, chicken breast, garlic, and ginger into the Instant Pot insert. Click the “porridge” button and set it. Quick or natural release when it’s done and give the congee a stir.It might be too thick, depending on preference so thin it out with extra chicken stock as needed. Remove the chicken breast, shred, and add back in. Season with salt and enjoy.